The work which presents us here Olivier Sierra does not miss originality. For years, the author collected several hundred totally new photos, quite dedicated to the period of the occupation in France. Unfortunately, due to sales rights restrictions, we cannot offer They were there! for sale in your country. The work which presents us here Olivier Sierra does not miss originality. 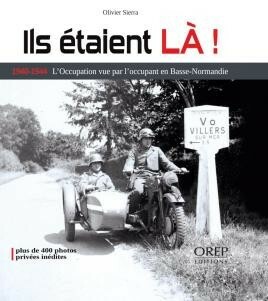 For years, the author collected several hundred totally new photos, quite dedicated to the period of the occupation in France. Reproduced in large format, presented in a chronological order and accompanied with a brief indicating comment, among others, the place of the shooting, the reproductions show us images warriors, propaganda images or still images of the everyday life of the occupants in countrysides and cities of France. Of an easy access, the present album brings to the reader plentiful and new one documentation over this period.